Consumer champion, Which? have carried out research that claims the UK’s large energy companies would need to work around the clock, installing 24 smart meters per minute to meet the 2020 roll-out target. 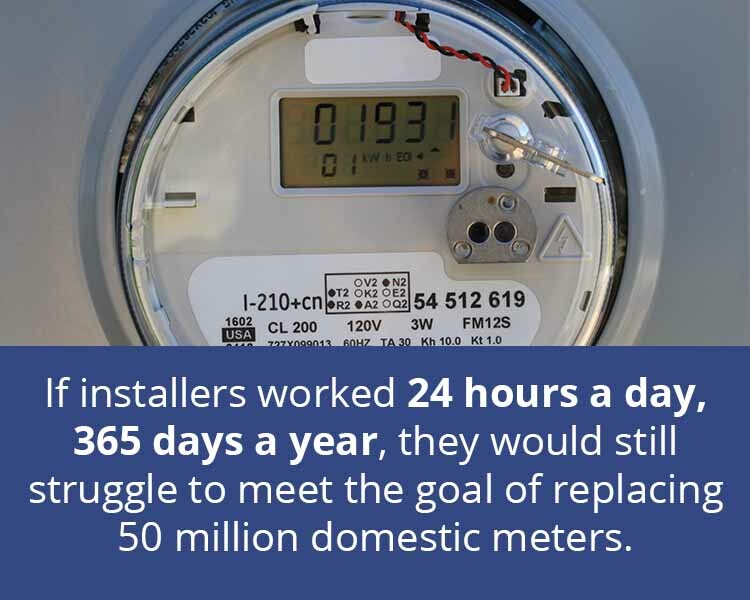 Their research shows that even if installers worked 24 hours a day, 365 days a year, they would still struggle to meet the goal of replacing 50 million domestic meters. The Government estimates the roll out of domestic and non-domestic smart meters will produce economic benefits of £16.7 billion, with domestic devices saving £47 on the average bill per year by 2030. So far fewer than 9 million domestic smart meters have been fitted and the £11 billion project has seen its fair share of problems. There have been delays to a vital IT system (the DCC wireless network), issues over installations and some meters losing functionality when customers switch supplier. Most of the domestic smart meter installations so far have come from the 12 largest energy companies but they would need to fit around 250,000 meters a week to meet the 2020 goal. Energy and Clean Growth Minister Claire Perry told Parliament that smart meters were being installed at a rate of 400,000 a month. While the energy companies publicly maintain that they will meet the target, Which? believes this is unlikely given the current pace of installation. British Gas claims it is installing a smart meter every 25 seconds – It accounts for around 4.5 million meters installed. Other companies must fit meters more frequently for the industry to meet the deadline. Feedback from energy customers who have recently had a smart meter installed, has been pretty positive. At least three quarters of Which? members with smart meters said their device had met or exceeded their expectations on a number of measures. Not having to submit meter readings (91%). 59% said their smart meter and its In-Home Display (IHD), had changed their understanding of energy use and costs to some extent. 43% don’t use the IHD (27%) or don’t understand the IHD (13%). 42% smart meter owners have had a problem. The most common problem seems to involve smart meters losing functionality when switching supplier. Around 866,000 of smart meters installed in homes are currently operating in ‘dumb’ mode. “Smart meters have a critical role to play in making the energy market function fairly and more competitively, as well as giving customers a better switching experience and more control over their energy use and bills . Logic4training is one of the UK’s leading National Skills Academy for Power (NSAP) approved training providers.